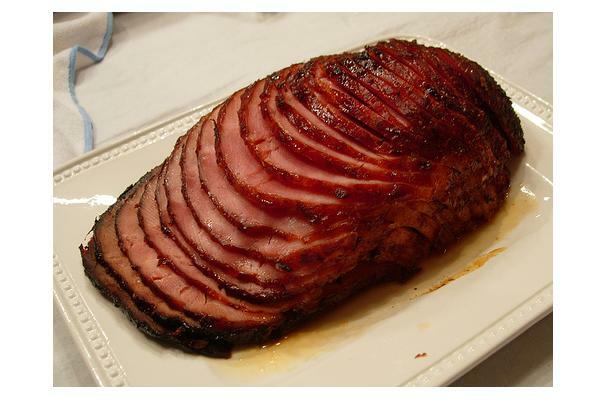 Baked Ham is a delicacy that is often served at special occasions like Thanksgiving and Christmas. It is meat of pork usually made bone in or bone out. Served whole or Sliced. Choosing: Choose by size or lbs depending on how many people are being served. Buying: You can purchase at your local Grocery Store or Meat Market. Procuring: Ham is the thigh and rump of pork, cut from the haunch of a pig or boar. Although it may be cooked and served fresh, most ham is cured in some fashion. Cuts referred to as ham in the U.S. are also called gammon in the U.K., South Africa, Isle of Man, and Ireland. Ham can be cured, baked or served as is COLD!! Store in Cold Temps in the Refrigerator. History: In Italy, ham is called prosciutto, and can be either cured (prosciutto crudo) or cooked (prosciutto cotto). Earliest evidence of ham production in Italy comes from the Republican Roman period (400-300 BC). Modern Italian and European Union legislation grants a protected designation of origin to several raw hams, which specify where and how these types of ham can be produced. There are several such hams from Italy, each one with a peculiar production process. Parma ham, the so called Prosciutto di Parma, has almost 200 producers concentrated in the eastern part of Parma Province. Its production is regulated by a quality consortium that recognizes qualifying products with distinctive mark. Only larger fresh hams are used (12-13 kilograms). Curing uses relatively little salt, but can include garlic salt and sugar, producing a sweeter meat. After salting, the meat is sealed with pig fat over the exposed muscle tissue, which slows drying. Curing occurs over a minimum 12 months. This curing method uses only salt, without nitrates and without spices. No conserving substances are added. San Daniele ham (Prosciutto di San Daniele) is the most similar to Parma ham, especially the low quantity of salt added to the meat, and is the most prized ham. Other raw hams include the so called "nostrani" or "nazionali" or "toscani"; they are more strongly flavoured and are produced using a higher quantity of salt.